A fixed-pin penannular-style plaid brooch. The design of this brooch is inspired by the Battersea Shield, considered to be one of the finest pieces of Celtic Art to have survived from the Iron Age. Dredged from the Thames in 1857, it is assumed to date from sometime between 350 and 50BC - before the Romans first came to Britain. 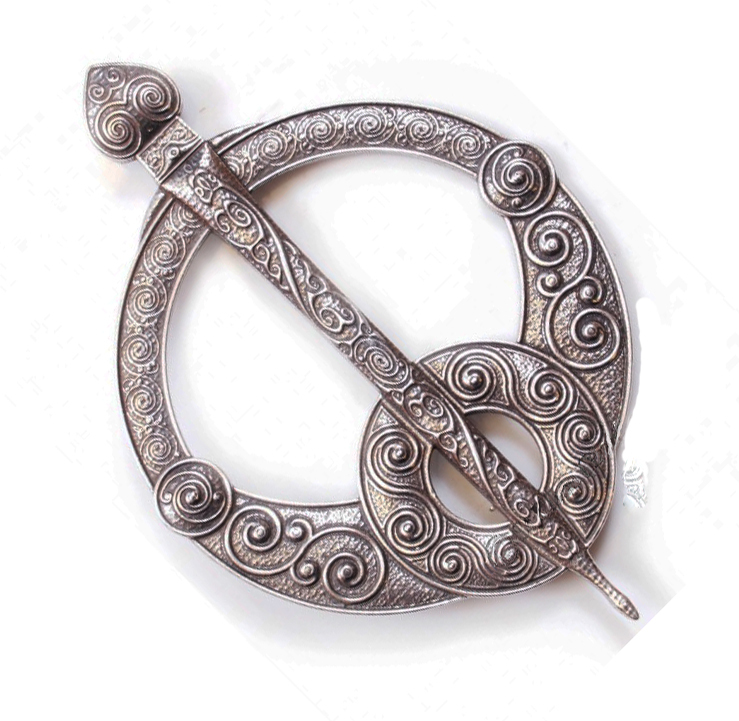 Brooches with large movable central pins were near universal as garment fasteners in the Iron Age, although the design was heartily adopted and elaborated by the peoples of Scotland and Ireland in the centuries between 700 and 900AD. This is a large brooch, 120mm long and 80mm wide - ideal for use with our fly plaids, or upon a shawl. The plaid brooch was traditionally a decorative weight, to keep the plaid attached to the wearer, as well as to show off the status of its wearer. Completely designed, cast and finished in Glasgow , cast in 100% lead-free pewter.